The basic tape head action involves an oscillating current in a coil. The magnetic field produced in a ring of ferromagnetic material fringes out to the tape material at the gap. For stereo cassette tape heads, there are two such mechanisms to record and playback from parallel tracks on the tape. 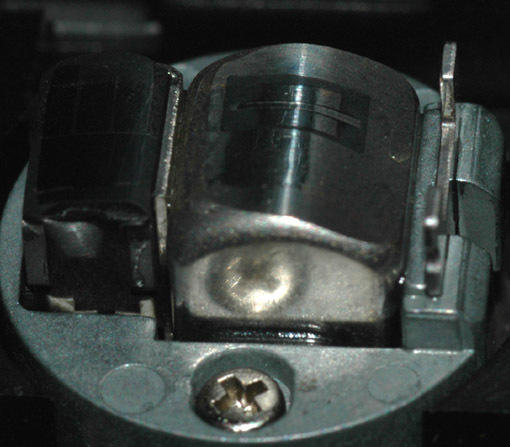 This is the head structure in a Kenwood tape deck. The structure to the left of the head may be for erasing. The head is about 7 mm from left to right in the image. The recording medium for the tape recording process is typically made by embedding tiny magnetic oxide particles in a plastic binder on a polyester film tape. Iron oxide has been the most widely used oxide, leading to the common statement that we record on a "ribbon of rust". But chromium oxide and metal particles provide a better signal-to-noise ratio and a wider dynamic range. The oxide particles are on the order of 0.5 micrometers in size and the polyester tape backing may be as thin as 0.5 mil (.01 mm). The oxide particles themselves do not move during recording. Rather their magnetic domains are reoriented by the magnetic field from the tape head. Tape heads for stereo cassette tapes must record on two tracks simultaneously.